Arriving at the Edmonton airport on April 30, 2015, we were met by a gentleman from Stetson Motors, who took us in his well-used minivan 133 kms to the southwest and the dealership in Drayton Valley, Alberta. It took a moment to locate our car, surrounded as it was entirely by a sea of big pickup trucks. 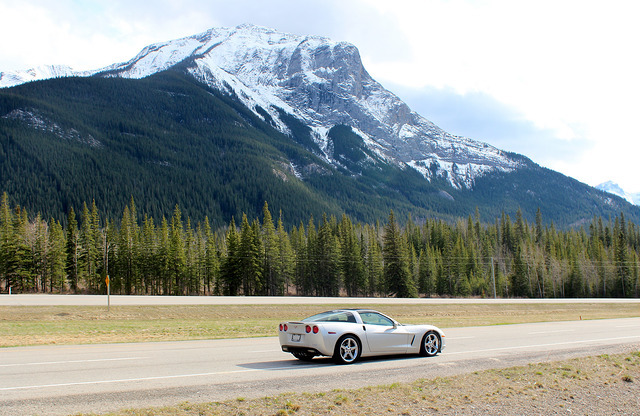 Drayton Valley is in the heart of oil production country and there is probably not much call for low-slung sports cars, particularly since all the roads except primary ones appeared to be gravel. The car was detailed to perfection and I was invited to take it out for a drive. While sitting in the parking lot, we went through all the controls, from seat heating switches to turn signals to the horn and audio system and everything checked out. I had only been a passenger in my friend Bill's car as he had some kind of weird finicky racing transmission so I preferred not to drive it; this was actually my first time driving a Corvette ever. 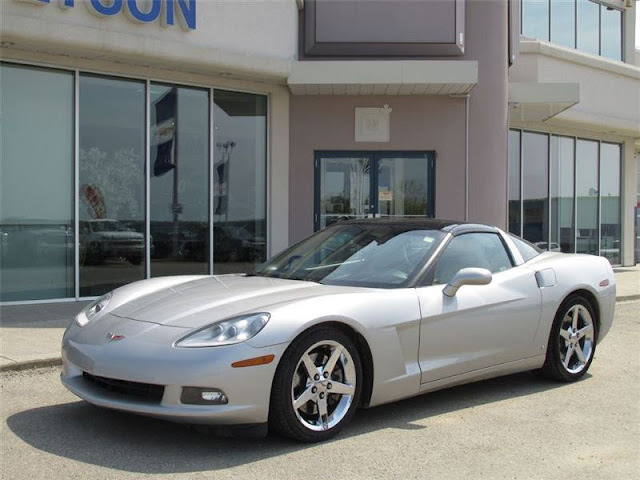 I had read the Owner's Manual while still at home and was pretty familiar with the controls but as we left the dealership I was impressed with how easy the car was to shift. It took far less effort that many of the German cars I had rented in Europe. As before, I was impressed with the excellent visibility but now in control I could also see just how powerful the car was as we opened it up along a straight stretch of very deserted road. The NPP exhaust cut-out gave an impressive roar as we accelerated and suddenly we were were at 150 km/h, with the car feeling as if it was just getting started. On the return to the dealership, I tried an acceleration in a lower gear and could feel the back end immediately start to swing out. 436 hp needs to be treated with respect but it was not hard to control again. There was some paperwork to complete and a document from the local branch of the Royal Bank and the car was ours. The last thing was to go to the license office and obtain a temporary permit to allow us to ferry the car home. We were allowed one week and the requirement is to go as directly as possible. A quick lunch at the local Tim Horton's and then it was time to hit the road. 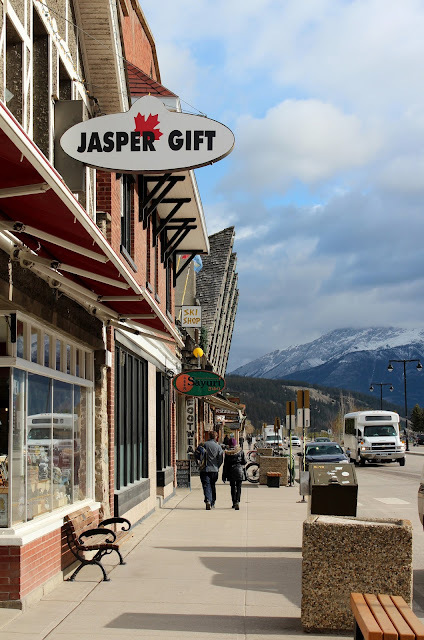 My GPS must have been set incorrectly as instead of heading east we found ourselves continuing west somehow along AB 16 via Hinton and after three hours we found ourselves in the Jasper National Park. 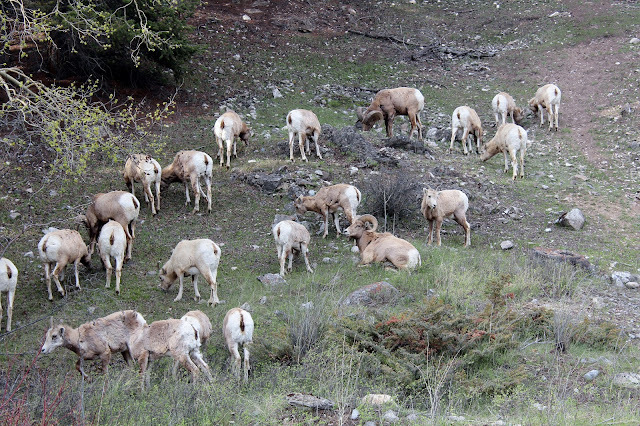 Shortly after passing the entrance we came to a hill where a large congregation of bighorn sheep so of course we had to stop and look at them. The road through the park provides views of lovely scenery; I had not realized that Linda had never seen mountains before! In the summer I suspect the road is very heavily travelled but on this last day of April there was almost nobody else driving. We gradually meandered through the vistas of mountains, rivers and forest to the very nice Sawridge Inn, where we fortunately had made a reservation (! 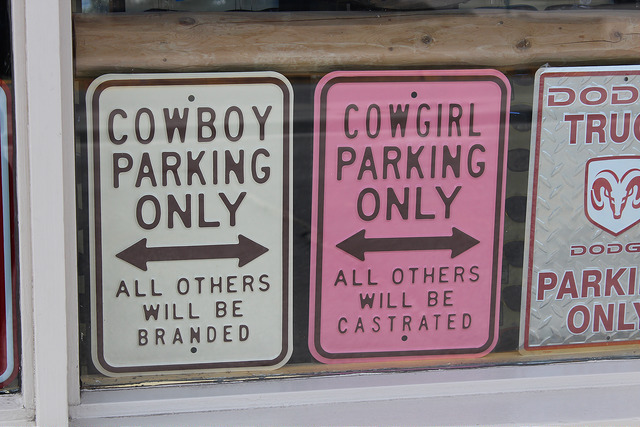 ), just outside the town of Jasper itself. The receptionist had a name badge with a very German name and when I asked it turned out that he was in fact from Germany and was delighted to have a conversation with me in German. It had been a long day between the flight, the three hour time difference and five hours in various vehicles, including our new one. The Corvette was proving itself to be a very comfortable long distance cruiser, Cadillac-like when you enjoyed the stereo and the leather seats and the surprisingly quiet interior, Corvette-like when you pushed the loud pedal or steered through tight corners. I particularly enjoyed the Heads Up Display, which my friend Bill insisted was a great feature to get, and he was right. Up bright and early the next morning, we celebrated the arrival of May with an excellent breakfast at the hotel and then drove into Jasper itself and walked around the town for a while. 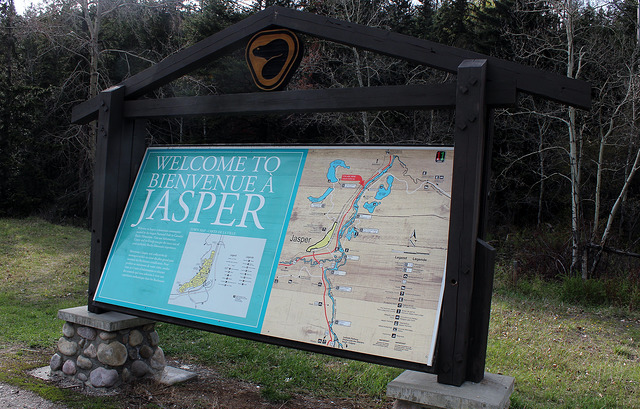 Jasper (population 4,000) was first established a Northwest Company trading post in 1813. 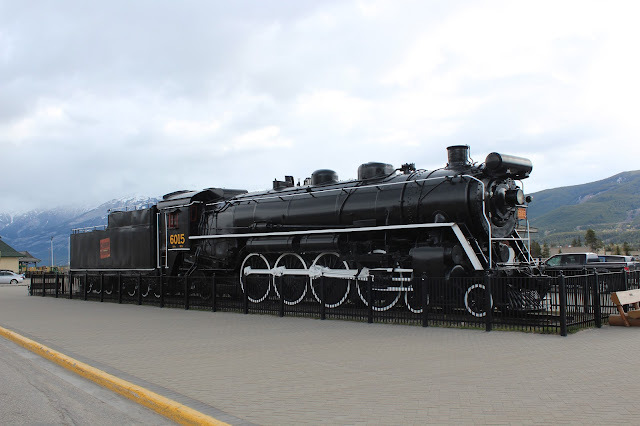 The Grand Trunk Railway established a siding in the city and there is a very charming station, built in 1926. 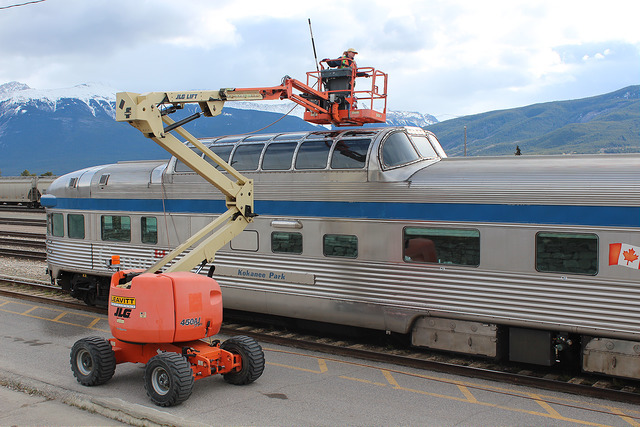 Jasper is the terminus for the Rocky Mountaineer train trips through the Rockies and we saw one of the "vista coaches" being washed while we walked by. The architecture of the town is Western Rugged and a lot of stone is used, to good effect, There is a very nice Visitor Centre as well as the usual stores you will find in a town that lives from tourism. 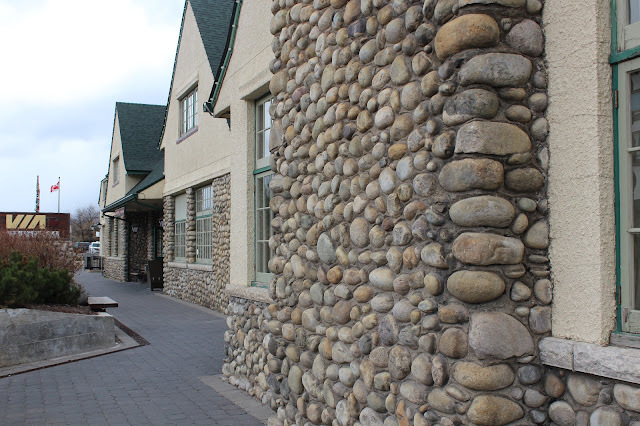 The Visitor Centre itself was designated a Heritage Building in 1992. 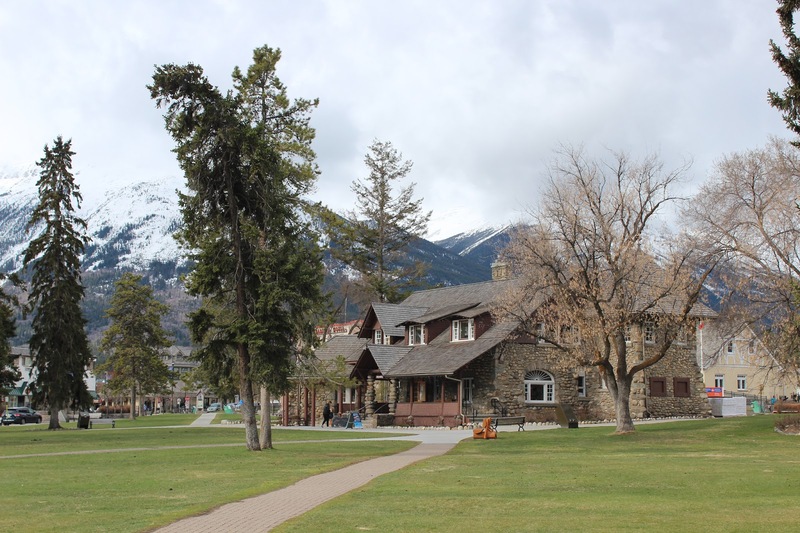 It was constructed in 1914 and served as the administrative office for the park. It was time to load up the car and head to our next destination, Banff, driving along the famous Icefield Parkway.